What Is the Equivalent of Fresh Ginger Root to Ground Ginger? When your recipe calls for fresh ginger and you only have ground ginger on hand, you need to know how much to use as a substitution. But even equivalent amounts have different nutritional and health benefits. The pungency and flavor of dried ground ginger differ from those of fresh ginger root. Even though you can substitute one for the other in a pinch, they each tend to work better in different types of dishes. Ground ginger is preferred for baked goods and spiced drinks, while fresh ginger is used in savory dishes, especially in Asian cuisine. You may need to experiment to find just the right amount to use in your dish. The Cook's Thesaurus reports that 1 tablespoon of fresh ginger root is equal to 1/4 teaspoon of ground ginger. At Food.com the recommended equivalent is 1 tablespoon of fresh ginger for 1/8 teaspoon of ground ginger. The amount of fresh or ground ginger consumed in a serving of food is usually too small to deliver many nutrients. But you can still compare the two ingredients by looking at 1 teaspoon of ground ginger and 4 tablespoons of fresh ginger. One teaspoon of ground ginger provides 30 percent of the daily value of manganese, based on consuming 2,000 calories daily. By comparison, 4 tablespoons of fresh ginger only has 3 percent. Four tablespoons of fresh ginger contains 2 percent of the daily value for fiber, potassium, vitamin C and vitamin B-6. One teaspoon of ground ginger has half that amount. Fresh ginger root primarily contains gingerol, but it changes when exposed to heat. When the root is dried to produce ground ginger, the gingerol converts into another active ingredient, shogaol. Gingerol in fresh ginger helps reduce pain. It's also the ingredient you need to relieve nausea and settle an upset stomach. 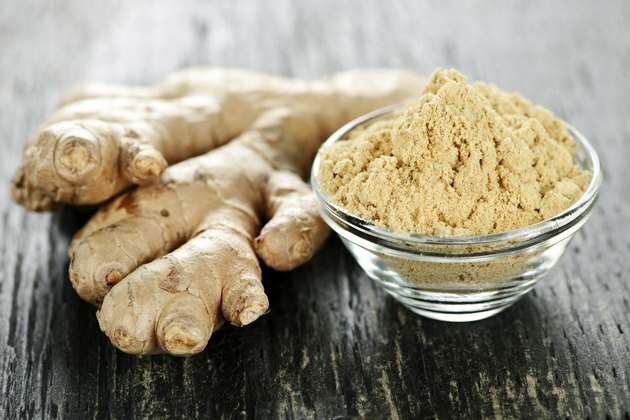 Both active ingredients have anti-inflammatory and antioxidant abilities, but shogaol in ground ginger may be more potent in these roles than gingerol, reports a review in Preventive Nutrition and Food Science in June 2012. Ginger is safe when consumed in normal amounts through foods, but if you take supplements or consume large quantities, it may interact with some medications and medical conditions. To stay safe, consult your physician before consuming either form of ginger if you're pregnant or you take prescription medications. Ginger may slow down blood clotting, which increases the risk of bleeding in people who have a bleeding disorder or take anticoagulant medications. If you're diabetic or take medications to control diabetes, be sure to carefully monitor your blood glucose because ginger may lower levels of blood sugar. People taking calcium channel blockers to lower blood pressure should also be cautious with ginger because it might cause a drop in blood pressure or cause an irregular heartbeat. Is Fresh Ginger Safe to Eat During Pregnancy?